Xscreen is simply amazing call screening software to get the most out of your Telos multi line talkshow system and get the best calls to air quickly and easily. Simple to install and use, yet powerful enough to deal with even the most demanding talkshows. With a free and premium edition, cloud based or local server XScreen makes it easy to get the most from your Telos Multi-line Phone Systems and VSets supporting the VX, VX Prime+ HX6 & iQ6 systems. The intuitive XScreen user interface keeps you informed at a glance and in control with a single touch. XScreen software provides call control, call screening, data capture and chat functionality enabling you to quickly answer, screen and route calls across multiple PC clients. The cloud based database keeps a log of calls and provides further alert and directory functionality. 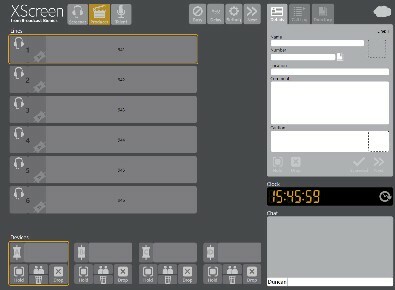 XScreen can record and manage caller audio (Livewire systems only) XScreen can additionally act as a softphone for talking to and screening callers directly through a USB headset or soundcard on your XScreen client PC. Use XScreen completely FREE for 3 months, after which you will be prompted to take out an annual Subscription. If you choose not to subscribe you can continue to use XScreen lite with a limited set of features.